Just imagine the look on your children's faces when their own stretch limo complete with uniformed chauffeur and red carpet pull up outside their school or party venue. The screams will be heard for miles around! 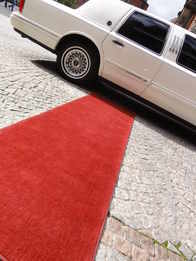 Our children's limo party hire includes. The latest chart and party music. Here's why you should book your childrens limo party with Limousines of Cheshire today! Apologies for late e-mail to you, but I would just like to say thank you soooo much for the wonderful Limo experience you gave to my daughter and her friends for her 16th Birthday. She says that the limo was the best bit of the whole evening. Her and her friends had an absolute ball. They said you were brilliant and so kind. They also want to know what the non-alcoholic champagne was as they all thought it was fabulous. Every time I rang you, you were cleaning your car! After seeing it so spotless I understand why. Once again thank you so much. I will forward some photos to you in the next few days. Hi, just wanted to say a big big thankyou for making my daughters birthday amazing! her & her friends loved the limo. you did a perfect job. Just wanted to thank you for a great service today, The boys absolutely loved the limo and said that you were cool ( coming from a bunch of 11 year olds that's quite impressive). we will definitely be using your limo service again, if you get chance could you see if you have the 8th or 9th of December free please, times need to be confirmed as its my sons birthday. Hire your kids party limo in Cheshire with confidence - All our stretch limousines are fully licenced and regulated by Cheshire West Council and undergo 6 monthly safety checks. Your limo chauffeur is also licenced with Cheshire West Council and has had full disclosure C.R.B checks and full medical. Your childrens safety is our main concern!